Rediff.com » News » The young rule the world! The young rule the world! Dave is Britain's youngest PM in 200 years! Grey hair and seniority are no longer criterion to rule countries; the latest in the growing list of young -- under 50 -- leaders is British Prime Minister David Cameron. Following Barack Obama's election as America's president in November 2008 and Dmitry Medvedev's election as Russian president earlier that same year, 43-year-old Cameron's appointment may indicate that the masses believe that younger leaders can do a good job of ruling a country. Liberal Democrat leader Nick Clegg, now Britain's deputy prime minister and the toast of the recent election campaign, is a few months younger than Cameron. Closer home, we have a young leader whose influence grows each week. Unlike Messrs Cameron, Medvedev and Obama, Congress General Secretary Rahul Gandhi was not born in the 1960s. He is a child of the 1970s and will turn 40 next month. 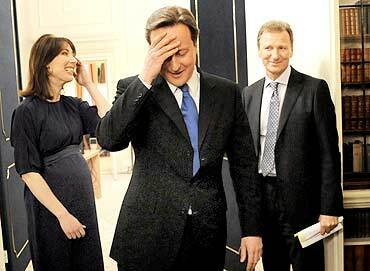 David Cameron was born to wealth and is a pucca member of the British aristocracy. He has since transformed himself into a man of the people and staked his political reputation to bring his Conservative party to more centrist ways and regain power after 13 long years in the wilderness. Dave (born October 9, 1966) -- as he likes to be known now -- is the youngest British prime minister in more than 200 years, and is more an avatar of Labour leader Tony Blair than Margaret Thatcher, the patron saint of the modern-day Conservative party. Dave, who is known to ride a cycle to the House of Commons, the British parliament, has had a meteoric rise to the pinnacle of British politics. A decade or so ago, he was handling PR for a prominent British company; then he plunged into politics. As prominent Conservatives like William Hague -- that 48-year-old was once the wonderboy of British politics and considered a future prime minister till he lost the 2001 general election -- were shunted aside by electoral defeats and aggrieved party cadres, Dave made his way up. Five years ago, when he was elected leader of the Conservatives, no one gave him a chance. Oh, look at him now! 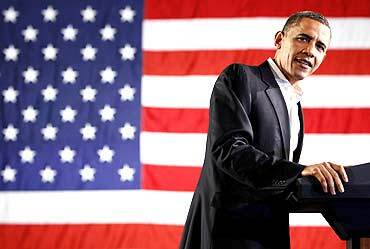 Barack Obama, born on August 4, 1961, is not the youngest president of the United States. No, JFK was not the youngest either; John F Kennedy was 43 years and 7 months when he was sworn in as America's 35th president. Barack was 47 years and 5 months when he was sworn in as the 44th US president. Obama's predecessor, George W Bush, was 54 when he entered the White House. Bush's predecessor, Bill Clinton, was 47 and some months when he became president. Both Clinton and Obama are August born (Bill was born August 19, 1945). Bush, Clinton and Obama's elections mean America has reverted once again to youthful presidents. Bush's dad, George H W Bush, was 64 when he was elected president in November 1988. Papa Bush's predecessor, Ronald Reagan, was a fortnight short of 70 when he took the oath of office in January 1981. The man he defeated in the presidential election, sitting president Jimmy Carter, was just 52 when he took charge of America. Youth and popularity, it appears, have no co-relation. Richard Nixon, arguably America's most unpopular president, had just turned 56 when he took the oath of office. Ronald Reagan was widely considered to be America's most popular post-World War president; he was a fortnight short of 78 when he retired from office in January 1989. Youth in Moscow at last! When you recall all the craggy, old, faces who ruled Russia and its parent, the Union of Soviet Socialist Republics, since the October Revolution of 1917, you will be hard pressed to find a face as buoyant and youthful as Dmitry Medvedev. President of Russia since May 7, 2008, Dmitry was just 42 when he was elected. 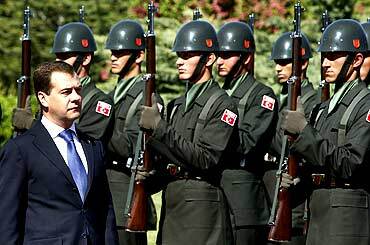 Most observers dismissed him then and now as a proxy for his mentor Vladimir Putin, who stepped aside as president after the mandatory two terms in office and took over as the country's prime minister. Though Putin still appears firmly at the controls of power, Dmitry -- who worships Deep Purple, Led Zepellin, Black Sabbath and Pink Floyd -- has had more success than Vladmir at establishing a friendly relationship with US President Barack Obama (who is just four years older than him; Dmitry was born September 14, 1965). On Tuesday, the head of Russia's nuclear programme attributed last month's US-Russia nuclear treaty solely to the chemistry that both Barack and Dmitry share. Putin was almost 46 when he became the Russian Federation's second president, a youthful change from the bumbling Boris Yeltsin. But the former spy, who rarely smiled in public, was a difficult personality for most world leaders to establish an easy equation with. Happily for India, Putin reversed the downward slide in India-Russia relations in Yeltsin's regime and restored New Delhi's importance in Moscow's world-view, a status Medvedev has continued to enhance. Rahul Gandhi does not rule his country yet. If his Congress party has its way, he will be India's prime minister some day, if not very soon. Whether it is mid-way through the United Progressive Alliance's second term in power or if it will come after possible triumph in the next general election remains -- like most things concerning the enigmatic Congress general secretary -- in the realm of speculation. His father Rajiv became India's youngest prime minister aged 40 -- thrust into a very difficult role at a very troubling time by the sad circumstances of his mother Indira Gandhi's assassination -- and it is unlikely that Rahul, who turns 40 on June 19, will break that record. It is possible that he may be closer to his grandma in age if he becomes prime minister -- Indira Gandhi was 48 when she was chosen to lead India after the tragedy in Tashkent after Lal Bahadur Shastri died suddenly and mysteriously. His great grandfather was not much older than his daughter when he ascended to office at the midnight hour when India woke to light and freedom -- Jawaharlal Nehru was 57 when he made India's finest political speech. 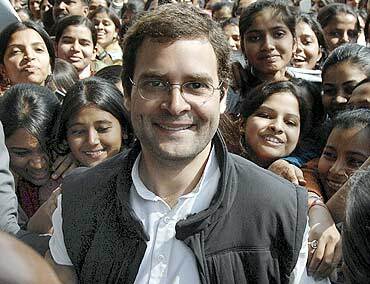 If Rahul becomes prime minister, India -- which has the largest number of young people under the age of 30 (by one estimate 540 million people!) -- will once again have a youthful leader after the parade of seventy plus years olds who have ruled its destiny since June 1991.